Hot on the heels of metro level household income data, we now get the annual metro GDP figures as well. 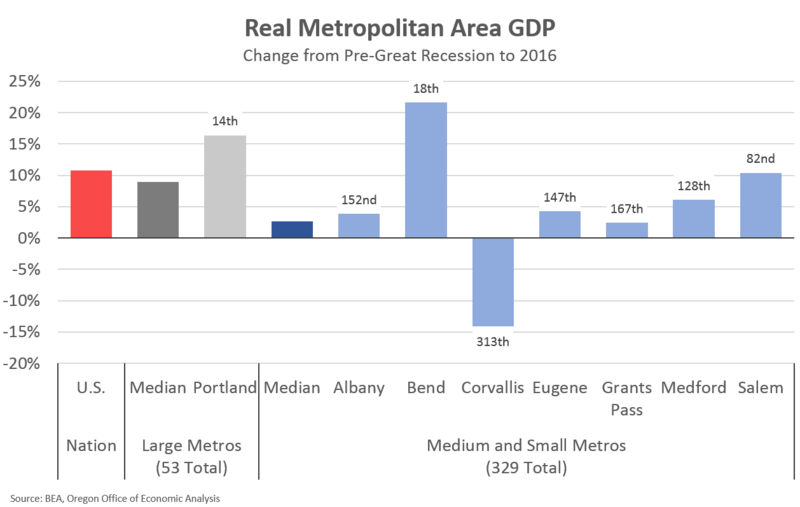 In stepping back and looking at the bigger picture, the metro GDP growth looks like one would expect. There is a good reason for that. More in a minute. Oregon is outperforming the typical state for jobs, wages, and GDP. As such, all of our metros are above average in the most recent data, which makes sense. The specifics can vary a bit, particularly as Albany and Bend register Top 10 in the nation growth. Albany’s growth is led by manufacturing, both durable and nondurable goods. Bend’s by health, professional and business services, and finance. That last one is interesting as Oregon is not a financial hub. Certainly something to look into in the future if it continues. This second chart compares metro GDP over the entire business cycle. Where are you today relative to before the Great Recession? Here, again the patterns looks like you probably expect. All metros are in the top half or better. Oregon is more volatile. We fall farther in recession so have further to regain in expansion, etc. However one metro sticks out. One is not like the others. Let’s take a little closer look at the Corvallis MSA (Benton County.) In looking at the industry level GDP, the issue is all about manufacturing value-added. Hmm. This is a really big rise and subsequent fall. The timing is also of interest given the declines didn’t happen until a couple of years after the recession. 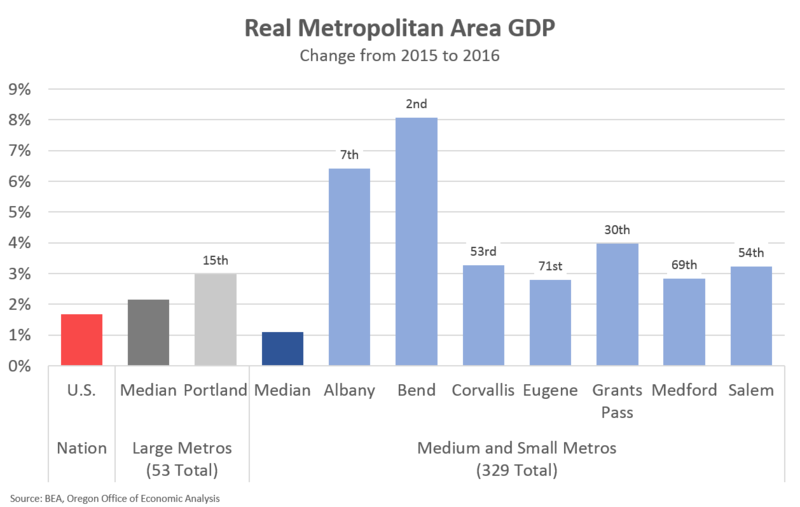 What I suspect is going on here is more about how metro GDP is calculated than what is actually happening in Corvallis. What BEA does is calculate state GDP by industry. BEA then shares that down to the metro areas based on earnings by industry. 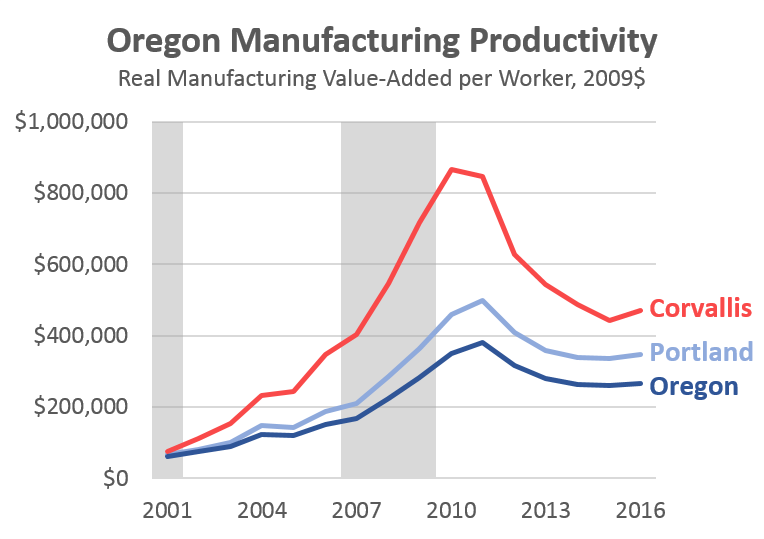 For example, and these are made-up, simplified numbers, if Corvallis has 10% of Oregon’s manufacturing earnings, then basically Corvallis gets 10% of Oregon’s manufacturing value-added. This is fine so far as it goes. However when a particular industry in one region is doing exceptionally well, then this sharing down method yields skewed results. I think walking through a few charts is best to explain this and show the limitations of the data/methodology. 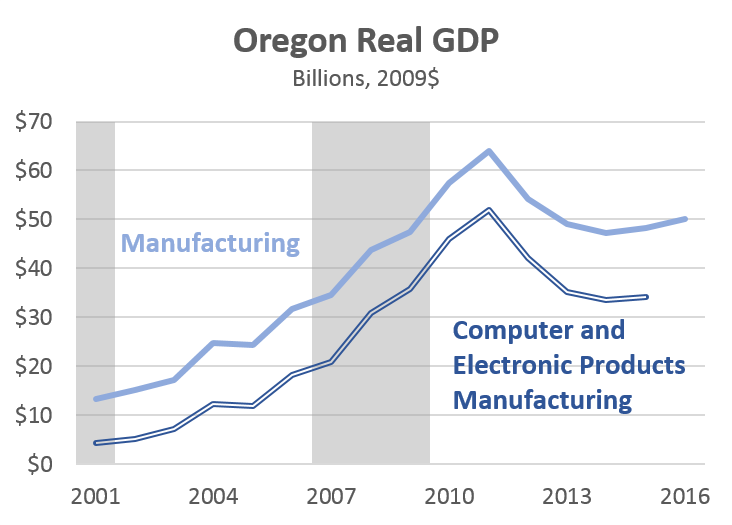 With Oregon GDP there is one, and only one industry that can move the needle like this: computer and electronic products manufacturing. This is also an industry that has a very specific geographic footprint for the most part: Portland, where the vast majority is, and Corvallis. At the state level you can see that the rise and fall of overall manufacturing GDP is all about computer and electronic products. While we don’t have access to the firm level estimates, we know a lot of this growth is due to new semiconductor technology. Each generation of chips, and the fabs that make them are more productive and valuable than the previous generation. It also requires massive investments every handful of years. That research and development occurs in the Portland region. The computer and electronic products in Corvallis are more printer technology related, which has not seen the same growth and investments like semiconductors in recent decades. Note: Detailed 2016 industry data is not yet available, that is why the total line extends to 2016 and the detail does not. 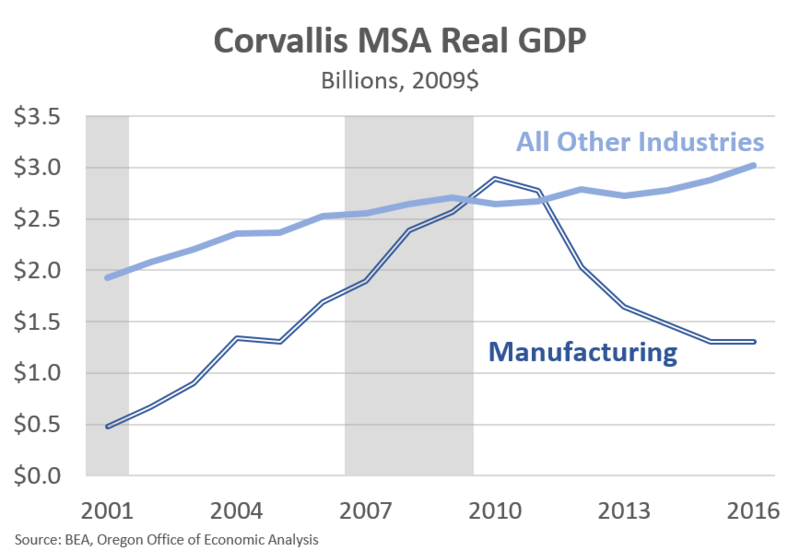 Now, we know that manufacturing employment in the Corvallis MSA is down and down considerably in the past decade, while Portland’s manufacturing employment has done reasonably well, compared with most regions of the country. However, when you take the state data and share it down to the regions some of that growth is distributed too. In this case, it means Corvallis has received a share of the Portland area investments and expansions because they are classified within the same industry. And the way you make all of this square, is seeing huge productivity gains (value-added per worker). 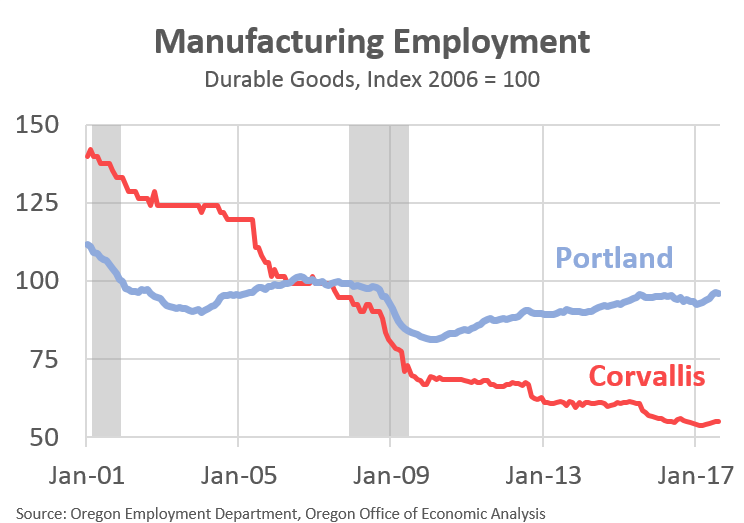 Are Corvallis manufacturing workers twice as productive as the typical manufacturing worker statewide? Possibly, but unlikely. Some of this, no doubt, is due to the local industrial mix. If a local economy has a mix of higher productivity industries and fewer lower productivity industries then the total will be high. That’s at play here, but so too is the metro GDP methodology. So, long story short, local level GDP data should be taken with a grain of salt. It is indicative of broad trends and what is happening in the local economy, however imperfect it may be. This is in no way meant to disparange BEA, they are doing the best they can with limited data. They do a great job looking at industry level value-added at the state level. This is fantastic data to have and helpful when looking across a host of economic metrics. I believe the GDP gains in the Bend-Redmond MSA coming from “finance” are largely tied to home sales. As you said, we aren’t a hub for traditional banking or investing, but the real estate market has always been a major driver in GDP gains (or declines). Obviously, I am more familiar with the employment figures, but financial activities GDP includes real estate broker commissions, as well as, residential investments (single family homes, improvements/ remodels, and multifamily residents). I am unclear how they seperate those residential investments from construction’s contribution to GDP. As you said, some of it must be local banks providing this investment.